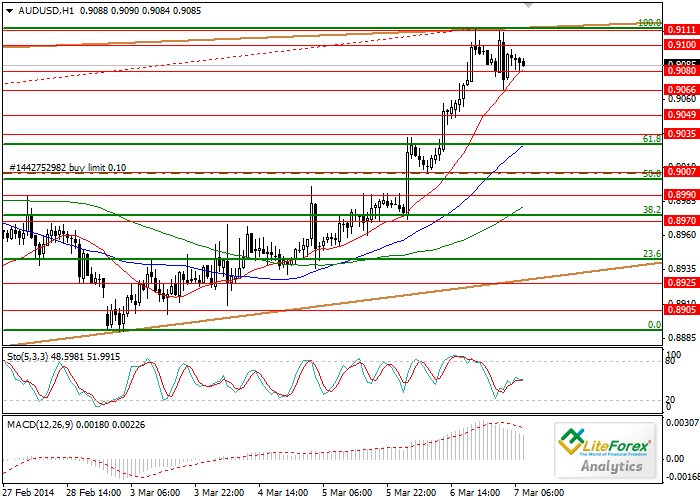 At the beginning of the week the pair reached local highs of 0.8890, after that trend shifted into ascending. Over the week the pair rose for more than 200 points, coming up very close to the level of 0.9110. However the pair failed to reach this level. Technical indicators show a chance of correction. Signal line of MACD indicator has left histogram and is directed downwards, its volumes are decreasing. Stochastic is in the middle zone, not giving a clear signal. However, all three moving average lines demonstrate continuation of growth. In case of correction, the pair may fall to 0.9035. Support levels: 0.9080, 0.9065, 0.9050 and 09035. The nearest resistance levels: 0.9100 and 0.9110. Key level of the “bulls” is 0.9170.